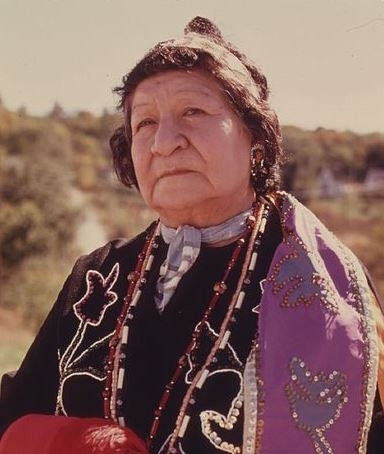 The Iowa people, refer to themselves as the Ioway or Bah Kho-je which means "People of the Grey Snow", are a federally recognized Native American people who reside in Kansas, Nebraska, and Oklahoma. Historically, they resided in the state of Iowa, therefore, the state of Iowa takes its name after the Ioway people. They are divided into two tribal bands. One band resides in Oklahoma with their Tribal Headquarters located 3 miles South of Perkins, Oklahoma & one half mile West of US highway 177. For information on the Oklahoma tribal band, see the Bah Kho-je website. Another band is the Iowa Tribe of Kansas and Nebraska on the Iowa Reservation. They reside at the borders of southeast Richardson County in southeastern Nebraska and Brown and Doniphan Counties in northeastern Kansas. Their headquarters is located west of White Cloud, Kansas. They operate the Casino White Cloud on the reservation. Iowa adhere to traditional religion, the Native American Church, or Christianity. Historically, their traditional religion taught that the "creator of earth", Earthmaker, resided in the upper realm and the "horned water panther" resided in the lower realm taking on human form on occasions. Earthmaker taught Iowa to observe the Medicine Dance, which is the principal religious ceremony of the Iowa. The legend taught that sacred powers (two male and two female) guarded the four quarters of the world. The four powers sought the power of life, and after not finding it instructed the Iowa to make offerings and to Earthmaker to receive spiritual blessings. For sacred cermonies, tattooed pactitioners carried medicine bundles and thus Iowa have shamans who help assist the people. Iowa also historically worshipped the Sun, Moon, Evening Star, the North Star, Thunder, and Wind. All of the elements are still very much a part of Iowa. The Native American Church mixes traditional religion with some aspects of Protestant beliefs. One defining sacrament of the Native American Church uses a chemical substance, the ethneogen peyote, for a religious, shamanic, or spiritual context. The Native American Church is the largest and most widespread indigenous religion among Native Americans in the United States. With the above in mind, though the Iowa are no longer considered unreached, evangelical Christianity still has very little presence among Iowa. Moreover, there is very little intentional evangelical church planting taking place among Iowa and therefore they are under-served. Pray God will call evangelicals to live near and share a contextualized message of the Gospel for Iowa. Pray God will work in dreams and other means to reveal that Jesus as Emmanuel is the creator Go who took on human form in order to become the one and only sacred object, place, and person for the Iowa people.